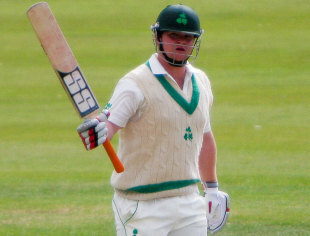 An aggressive century from Paul Stirling and a whirlwind 79 from Kevin O'Brien helped Ireland amass 435 for 7 on the opening day of their Intercontinental Cup 2011-13 match against Canada in Dublin. Stirling and Gary Wilson justified Ireland's decision to bat first by adding 155 for the first wicket at more than four runs an over before Wilson was trapped in front by Khurram Chohan for 61. Stirling fell soon after, bowled by Jimmy Hansra for 107, but he had given Ireland plenty of momentum, having struck 18 fours and 2 sixes in his 121-ball knock. Canada appeared to be fighting their way back into the match with two more quick wickets, but O'Brien joined Alex Cusack with the score on 236 for 4 and the pair savaged the bowling in the course of a 115-run partnership that spanned just 18 overs. O'Brien was the more destructive batsman and was particularly harsh on left-arm spinner Zahid Hussein, hitting him for three consecutive fours to get off the mark and then three more boundaries from four deliveries, as he raced to his fifty from 36 balls. He slowed down somewhat after that, and eventually holed out to at long-off having made 79 from 59 balls. Cusack also completed his half-century and had made his way to 81 before nicking one to the keeper. Stuart Poynter and John Mooney made sure there would be no respite for Canada though, with Mooney dropping anchor while Poynter made a run-a-ball 31 to take Ireland past 400 and towards an imposing first-innings total.